Add a personal touch to your home with vinyl wall art. Decorate your home with our wide range of unique vinyl wall art. Get a vinyl wall decal in any of our eight colours. Each colour comes in a stunning matte finish that creates a paint-like effect on your wall. Our wall stickers are made from EasyStick vinyl for easy application and simple removal. Take advantage of our free global shipping and start shopping here. Our Wall Art shop has lots of designs to choose from. Browse our collection of Kids Wall Art, Wall Borders, Shape Packs, or our large range of Wall Decals And Stickers. Vinyl wall art is a simple and beautiful way to decorate any room in your home. 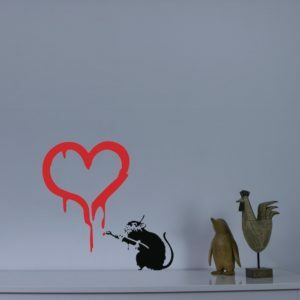 Grab yourself the popular Banksy Rat Home Wall Decal, Banksy Cleaner Wall Decal, the Floral Victorian Mandala Wall Sticker or any of our other vinyl wall art to add that final flourish to your room. Do you have a specific enquiry about one of our wall art products? Want a custom sticker size or design? Don’t hesitate to get in touch with our friendly team. We’d be very happy to help you.